2018 Annual Events Announced - Save the Date! This annual event has something for companies and organizations of all sizes. A “Shark Tank” style competition, a stock exchange and panel discussions for investors and startups. As an entrepreneur, hear from industry leaders, angel investors, venture capitalists, and more. As an investor, come listen to over 20 up-and coming companies pitch to those attending who have “Bulldog Dollars” to invest in their company of choice. A winner for each section is announced at the end of the night and a cash award presented to the companies. Visit www.bluetechvalley.org for more information as it becomes available. The event will take place at the Fresno State University Agricultural Laboratory and will feature 25 vendor exhibits and presentations at sites located on the 1,000-acre campus farm. Visit www.californiawater.org to see more information as it becomes available. Sweep Energy is a big data and Internet of Things company that utilizes machine learning to manage and analyze industrial data in an effort to help companies become more energy efficient and sustainable. It monitors the health of industrial equipment in realtime using wireless industrial equipment monitors. Every processing and manufacturing operation is heavily dependent on having healthy equipment, and Sweep provides companies with the ability to better understand and anticipate issues early on. A team from UC Merced created an efficient, low-cost home energy monitoring system and entered the UC Merced Mobile App Challenge. After winning first place in the competition in 2015, the idea gained footing and the team started building a company around their technology which became Sweep Energy in 2016. Rodan says that entrepreneurs should be diligent in engaging with potential customers early on, and that your idea will naturally morph as you build your network. He says this should be encouraged, as it helps better define your customers’ interests, but also to note that your product can't please everyone, so you must focus on the core product features that will provide the greatest value for your customers. To learn more about Sweep Energy, visit their website at sweepenergy.com. AMI Global is a global leader in the Industrial Internet of Things industry, specifically in the water management sector. AMI was established in 2009 with locations in the U.S. and Israel. It has recently moved into in the WET Center in order to become a part of BTV and to establish a presence for their Central Valley clients, and we are happy to welcome them! AMI’s IIoT solutions allow customers to connect equipment to the Internet, achieve data collection and analysis, and secure control of remote assets including pump control. It has an existing customer base of Fortune 500 clients and global industrial systems and equipment manufacturers, and has recently been presented with the Frost & Sullivan’s 2018 North American Integrated IIoT Solutions for Process Equipment Entrepreneurial Company of the Year Award. To learn more about AMI Global, check them out at AMIGlobal.com. Evan Ram is BlueTechValley’s client coordinator. He is a Junior at Fresno State studying agricultural business with a plant science minor, and is part of the Fresno State Army Reserve Officer Training Corps (ROTC) as well. Evan is from Firebaugh, California, and enjoys playing video games, spending time with friends, being outdoors and traveling, and taking advantage of as much sleep as he can. “What I love about working at BTV is learning about the different kinds of technology that many of our ventures have to offer, what their venture does for business, and how their technology can benefit in the water, energy, and ag sector,” says Evan. For more information or to register, email info@calseed.fund. 11 AM Workshop: Topic to be announced. Click here to register. 11 AM Webinar – Click here to register. 10 AM – 2 PM office hours. Click here to register. Did you miss last month's webinars? Check them out at bluetechvalley.org! The WET Center’s new office space is nearly finished and is expected to be open the 22nd and 23rd of March! 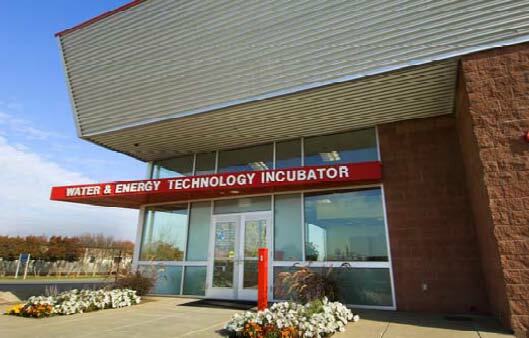 The WET Center is still in search of water, energy, and ag technology related companies to occupy the new space. If you are interested in seeing the brand new offices or want to apply, click here! One of our BTV companies, Opcondys, is a finalist for the 2018 Cleantech to Market Partnership! Cleantech to Market (C2M) is a partnership between graduate students, entrepreneurs, researchers, and industry professionals to help accelerate the commercialization of emerging cleantech. In the process, C2M also develops the next generation of innovative cleantech leaders. To view a complete list of 2018 finalists or to learn more about C2M, visit ei.haas.berkeley.edu/education/c2m. California Energy Commission’s REAP (Renewable Energy for Agriculture Program): Click here for more information. UC Riverside's International Affairs Office and the UCR Career Center are hosting a conference on global food and water insecurity, and how technology can amplify sustainable solutions. students, faculty, researchers, and businesses: to learn more or to submit a presentation idea, click here!